Welcome to St. John the Baptist Parish & School in Edgar, Wisconsin. When school is closed, 8:15 am Mass will still take place. Please note that sidewalks and parking lot may not be shoveled and/or salted. Be sure to check our community page at Formed.org! There are very good selections for Lenten prayer and devotions, a documentary on becoming Catholic, as well as a very thought-provoking e-book of Biblical historical fiction for ages 8 and up. To view Bishop William Patrick Callahan’s Easter Message, click here. (1) St. John School is seeking to hire an elementary/middle school teacher for the 2019-2020 school year. To view the job posting for more information and to apply, click here. (2) St. John School is also seeking to hire an individual or individuals who enjoy caring for children for the Extended Care program (mornings and afternoons) beginning with the 2019-2020 school year. The hours for the position are generally 6:30 am – 7:45 am and from 3pm – 5pm (or when the last student is picked up) two to five days per week when school is held. For more information or to apply, contact St. John Parish at 715-352-3011. Click here for the list of winners of the 2019 Spring Raffle. St. John’s Parish will have Adoration, the Chaplet, and Benediction following the 9 am Mass for Divine Mercy Sunday. All are welcome. Saturday, May 4, 2019: First Holy Communion Mass will be on the first Saturday in May this year @ 4 pm. Due to this change, there will be no First Saturday devotions for May. Saturday, May 18th: There will be a pilgrimage to the National Shrine of Our Lady of Good Help near Green Bay. A day of prayer, this pilgrimage will include Mass at 11:00 AM and praying of the Rosary at 1:00 PM at the outdoor shrine of Our Lady of Fatima, weather permitting. Pilgrims will also have the opportunity to visit the apparition site. The cost is $25.00 per person. There will be a chartered motor coach transporting the pilgrims to and from the shrine. There will be several pick-up and drop-off sites between Medford and Hatley for everyone’s convenience. To reserve a seat on the bus, please mail check payable to Knights of Columbus Council 16280 to John Krautkramer at 12706 Rocking Horse Rd, Marathon, WI 54448. Please include your preferred pick-up/drop-off site on the “Menu” line of your check. Please feel free to contact John Krautkramer at 262-758-0652 (e-mail: jpkrautkramer@yahoo.com) or Bob Plant at 715-443-3562 for additional details and/or if you have any questions. Click here to view the itinerary for the pilgrimage. 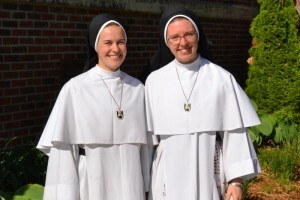 Dominican Sisters of Mary, Mother of the Eucharist. Information letter is available by clicking here. For Summer Camp registration form, click here. Click here to view the brochure for this pilgrimage. and 9 am – 7:45 pm on Wednesday. It will be there whenever the Parish Office is closed and Berg Sales is open. If you have any questions call the parish office at 715-352-3011. For the complete list of available SCRIP go to: shopwithscrip.com. Click on “Retailers” from the choices on the top of the page. On the left side of the screen you will see a big red box titled “Shopping Categories.” Under that is a blue tab to download the complete list of retailers available. This unique link will automatically ask if you want to support St. John Catholic Church. By clicking “Amazon Smile,” Amazon donates 0.5% of the price of eligible smile.amazon.com purchases to St. John Catholic Church. Don’t forget you can also use Amazon.com Scrip to pay for your purchase.